Christopher Nolan’s epic Batman trilogy launched seven years ago with “Batman Begins,” and now it wraps up with “The Dark Knight Rises.” This is a solid conclusion for a film franchise that has been nominated for over 100 awards and earned the love of millions of fans. The final film doesn’t reach the mind-blowing heights of “The Dark Knight,” but it provides a satisfying conclusion to Nolan’s trilogy. The story, as befits a film nearly three hours in length, is complex. Bruce Wayne (Christian Bale) has retired his batcape and become a recluse, limping around Wayne Manor with a cane thanks to his injuries from “The Dark Knight.” The police have finished cleaning up the city, and Gotham seems to be entering a new era of peace. Bane (Tom Hardy), an enormous mercenary at the head of a group of completely devoted and loyal soldiers, has different plans. Meanwhile, expert catburgler Selina Kyle (Anne Hathaway) can smell trouble and is working both sides to get what she wants. There’s a lot to like in “The Dark Knight Rises,” starting with (much to my surprise) Hathaway’s Catwoman. Selina Kyle is a tricky character to get right, and most of Nolan’s female characters are essentially plot devices rather than living, breathing people the way his male characters are. Thankfully, Selina is an exception. Hathaway’s performance is spot on, and supported by solid writing. Her Catwoman is a sort of Han Solo in stilettos, a self-centered rogue with a good streak and a fondness for the hero. She almost feels like the part was written for a man and then retooled a bit for a woman, like Ripley in the first “Alien” film. Like the first two films, the action sequences, tech, and special effects are thoroughly impressive, if not always very realistic. There’s a new vehicle for Batman, courtesy of the ever-fabulous Fox (Morgan Freeman) — this time it’s a sort of hovercraft he calls “the bat.” Bane provides a villain who can take a punch even better than Batman at his best. 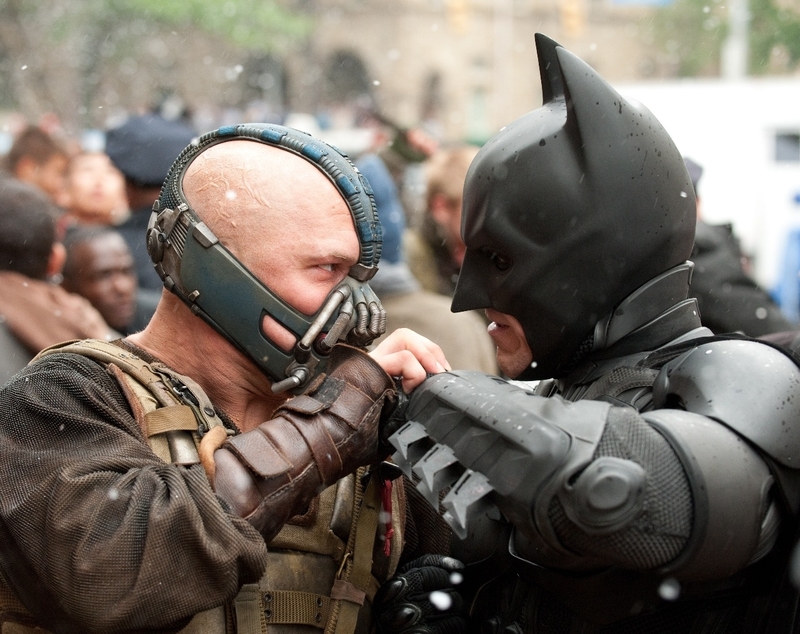 Unfortunately, Bane also provides the film’s biggest flaw: its central plotline. The various subplots, involving Wayne Enterprises failing without Bruce at the helm, Selina’s schemes, and Alfred’s concern for Bruce, are good, but Bane’s complicated plan to take over Gotham and prove some kind of point about the nature of its citizens has some serious problems. How well it works for you will depend entirely on how willing you are to suspend your disbelief. Suspension of disbelief is an issue for any Batman story, of course, for the simple reason that a billionaire using his money to dress up like a bat and pummel criminals mano-a-mano isn’t an efficient use of money. Bruce would do much more good if he used his wealth to fight systemic problems in Gotham. All this can be ignored by a willing audience, but Nolan puts this very point in the mouth of one of his characters and then fails to answer it. This might be forgivable in a film that wasn’t trying so hard to be gritty and real-world in its tone and visuals, but in the third film of a trilogy all it does is ruin Bruce’s heroism in the first two films by turning him into a narcissist with anger issues. Which, again, if you’re willing to suspend your disbelief, it works — but it’s a matter of personal taste. In short: if you adore the first two films of Nolan’s Batman saga, “The Dark Knight Rises” will likely provide a satisfying conclusion. If, however, you were already struggling to suspend your disbelief in the earlier installments, this one may push you over the edge.